In the cross Jesus triumphed over the spiritual forces of evil, winning the decisive victory over the principalities and powers. In Colossians 2.15 this victory is described using distinctive military imagery. There Christ defeated all powers and forces. 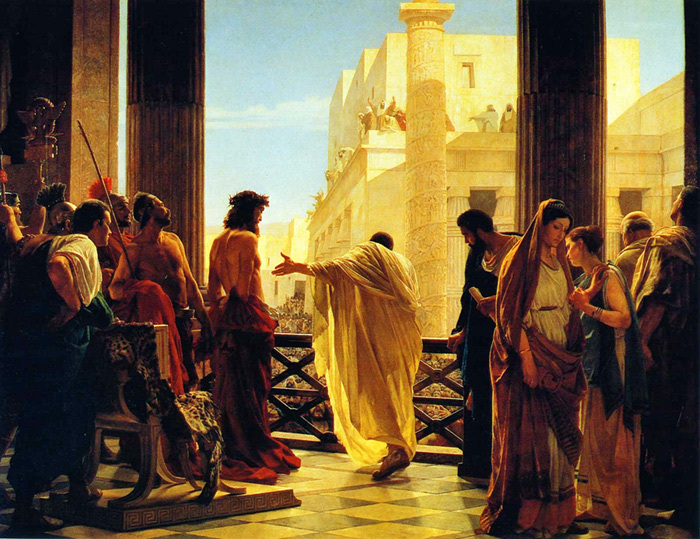 He let the whole world see them being led away as prisoners when he celebrated his victory. And on that cross Christ freed himself from the power of the spiritual rulers and authorities; he made a public spectacle of them by leading them as captives in his victory procession. He disarmed those who once ruled over us—those who had overpowered us. Like captives of war, He put them on display to the world to show His victory over them by means of the cross. What is startling about this sort of language is how, from all appearances, it is Jesus, nailed to the cross, who is the one being publicly shamed, defeated and humiliated by Imperial Rome. And yet, Col. 2.15 posits a crazy, insane and stunning reversal. On the cross Jesus makes a "public spectacle" of Rome. On the cross Jesus is shaming, disarming, humiliating and defeating the principalities and powers, taking them as captives in war. In reading your post, I was reminded of Psalm 68:18-35...kind of some Old Testament imagery happening here in Col. 2:15. Dallas Willard spoke also of the Triumphal Cross and how it shapes our lives in this modern context, that is that when we are suffering, "our response" can turn everything on its head. these thoughts also remind me of the This is Water video in that our awareness and then our response can transform ordinary moments and great moments of pain (ie:The Cross) into something else. By the way, any thoughts on the life and influence of Dr. Willard since he died last week? Here's a sad confession. I've never engaged with Dr. Willard's work. I never had the opportunity to hear him speak and I've not read any of this books. The Divine Conspiracy is on my shelf and I've always been meaning to read it, but I haven't yet. As to his influence, I know many of by friends have been greatly influenced by him and lamented his passing. BOTH Dallas Willard and N. T. Wright have pursued this exact line, Wright most deeply in the theology of it, Willard most deeply in its practical exposition. Willard views the Discourse on the Hill (Matt. 5-7) as the most important ethical teaching ever recorded by the most brilliant ethical teacher ever born...so you will find much to admire in his _Conspiracy_. For Wright, see _Jesus and the Victory of God_ (the scholar's account) and _When God Became King_ (the popular account), where he draws a straight, bold, dark line from Golgotha to cosmic victory. If/when you get around to't, may I recommend you give attention to his _Renovation of the Heart_? Its opening chapters set forth a dualist typology of the dimensions of the person that describes Willard's account of the relationships among spirit, will, heart, personality, character, and...psychology. Interested in your take on some of his analysis.